Glass end models offer greater product visibility for more attractive displays. Oversized and balanced refrigeration system, factory sealed and pre-lubricated for long life. 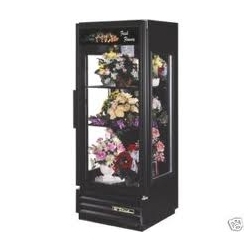 Designed to hold 35°F (1.6°C) to accommodate a broad range of floral arrangements. Exterior - non-peel or chip black laminated vinyl; durable and permanent. Interior - attractive, NSF approved, black aluminum interior liner with 300 series stainless steel floor. "Low-E", double pane thermal insulated glass side panel and door assemblies with extruded aluminum frames. The latest in energy efficient technology.